Little is added to what we already knew of this film's plot, but a big can of raunchy jokes has been opened here. Makes you wonder how much more of this we're in for when the actual movie hits theaters, since all manner of bodily fluids and sexual positions have been adressed in this three minute red band trailer alone. One thing this preview makes amply clear is that we shouldn't expect too much from the plot; as if we did. Yes, it's pretty intriguing from a philosophical view point, basically being a retelling of that classic episode of Star Trek: The Next Generation, The Measure of a Man. To what extent does artificial intelligence qualify as 'life'? And what are its rights under the law as dictated by man? All wildly fascinating stuff, make no mistake. But hey, we're talking about a live teddy bear in this case, so forget about any of it sticking for very long. It's not meant to be taken seriously by nobody. The only sticky stuff present in Ted 2, as overtly indicated by this trailer, will be sperm and alcohol. Butterfield is as good a choice for a younger Peter Parker as any, to my mind. His name certainly sticks out from the others on the shortlist, him having had the most big screen production experience and critical accolades that come with it. That said, do we want a younger Peter Parker? This is Spider-Man after all, not Spider-Boy. True, but in most every incarnation of the character, he started out at high school. He also did in both the Raimi trilogy and the recent Amazing Spider-Man reboots, but in both cases, the actor that portrayed the wallcrawler definitely felt older than the character was supposed to be (since in both cases, he was). So maybe it's about time we let the younger generation try its had at webslinging. No kids on the current Avengers slate, so let's diversify a bit and add one. It's sticking close to the Ultimate Universe the Marvel Studios movies have a knack of imitating. It might make the impact of the upcoming events in Captain America: Civil War hit home harder. Restricting superhero activity is one thing for adult superhumans, but what about teenagers? Requiring them to register their powers to the government, thus limiting their life options from an early age, does feel rather harsh. Hopefully a teenage Spider-Man played by an actual teenager does add some such intriguing new layers of superhero logistics and laws, if played right. And I'm fairly confidant Butterfield can play it right. ... this bit of news. No more Star Wars for Trank. Much like Gareth Edwards and Rian Johnson, he seemed like a fine choice. A talented young upstart, fresh from his first critical and commercial success. And therein no doubt lies the problem, as other than Chronicle, Trank has nothing to his name just yet. Sure, he directed a likable indie superhero flick, but handling a big blockbuster movie, especially one that comes with high expectations and related pressure, is another thing entirely. 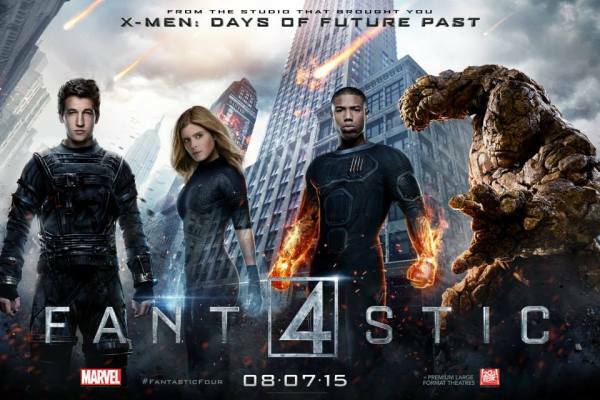 Word is things didn't go so smoothly on the set of Fantastic Four. So that might have made the right folks at Disney/Lucasfilm a tad nervous. You're not giving Star Wars to someone who can't even emotionally handle a small property like FF. Especially when there's ample time to find a successor. So the second entry in the Star Wars Anthology series is now in need of a new director. But what about Fantastic Four 2? Fox has already been planning that sequel for some time, with Trank slated to direct it. There's no word yet on whether Fox and Trank will part ways. Which again makes you wonder how much of these rumours are true. A grain of salt is a good thing to take with all this stuff for sure. The Internet may be playing Jedi mind tricks on us. And here's a mind trick for the members of the female audience who're into this sort of thing. A thirty second tease of Jamie Dornan putting on a tux and a silly mask, followed by a moaning sound. Not very subtle but it will do the trick. Less than two years to go until the release! Make sure to note it in your agendas and plan your lives accordingly, ladies! Even though nobody will honestly accuse Fifty Shades of Grey of being a good film, I'm sure the womenfolk will gobble up the sequel vigorously. But hey, men do the same with "their" franchises like Fast and Furious and all those darn superhero movies, so let's not get overly sexist here. Just remember, guys: in about three years time this will all have blown over and we can resume the everyday course of life as it nothing happened. It's not like anybody is talking about the Twilight movies and books anymore these days. Thankfully.